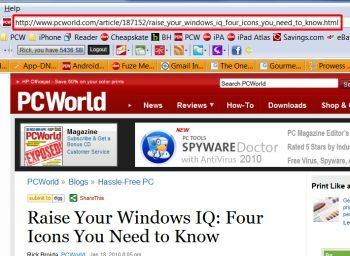 Back in January I wrote a Hassle-Free PC aimed at novice users, "Raise Your Windows IQ: Advice for Newbies." Given the questions I've been seeing in my inbox, I think it's time to revisit that series, to help Windows novices master more of the basics many of us take for granted. For example, sharing: I have a family member who, bless her heart, reads a lot of what I post online and often wants to share my articles with friends (thanks, Mom!). The problem is, she's confused by the icons for things like Digg, Reddit, StumbleUpon, etc. that usually accompany such online content. What if she just wants to e-mail my lovingly crafted words to someone? Mom's solution is often to copy and paste the text into the body of an e-mail, but (I love you, Mom!) that's a poor option. It usually results in a loss of formatting and any artwork or video that might be included. Plus, it doesn't include the actual link, which is what most people want. So, how do you share a Web page with someone? Simple: Click once in your browser's address bar to highlight the Web address (this works in both Firefox and Internet Explorer), then press Ctrl-C to copy that address to the Windows clipboard. Now create a new e-mail message in whatever program or Web service you use, then press Ctrl-V to paste the address into the body of the e-mail. Simple as that! Your Web browser makes this even easier. In Internet Explorer 8, click Page, then select Send Link by E-mail. In Firefox, select File, Send Link. Reader Jeff is curious about sharing links that are embedded in text on a Web page. He knows how to copy and paste from the browser's address bar, but he wants to provide the actual link that's under the hyperlinked text--not just the text itself. The long way would be to click that link (or open it in a new tab or window), then copy the URL from the address bar. But that's more work than necessary. To copy a hyperlink, all you need is our good friend the right mouse button. In Internet Explorer, simply right-click the link you want, and then choose Copy Shortcut. 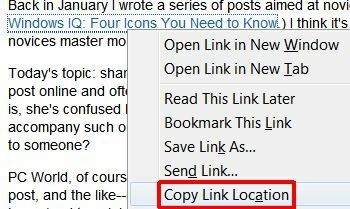 In Firefox, you right-click the link and then choose Copy Link Location. (Same deal for Chrome, Opera, and Safari, though the "copy link" wording might be slightly different.) Then head to your e-mail, word processor, or wherever and press Ctrl-V to paste in the link. Presto: You get the URL itself, not the hyperlinked text. Right-click the program's shortcut, and then click Properties. If you're a Windows 7 user and the shortcut resides on your taskbar, there's an extra step. After you right-click the Taskbar icon, look for the program name in the pop-up menu that appears, and then right-click that. Then you'll see the Properties option, which you can left- or right-click. You'll see the Properties window with the Shortcut tab already selected. Click the pull-down menu next to Run and choose Maximized. Click OK, and you're done! Just to clarify, the "program shortcut" is the icon you click (or double-click) to run the program in question. This icon might be on your desktop, in the Start menu, or on the Windows taskbar.